The weather forecast for a brown dwarf located just 6.6 light-years from Earth includes periods of patchy clouds, say astronomers in Germany, the UK, and France. The team is the first to glimpse such features on a brown dwarf. 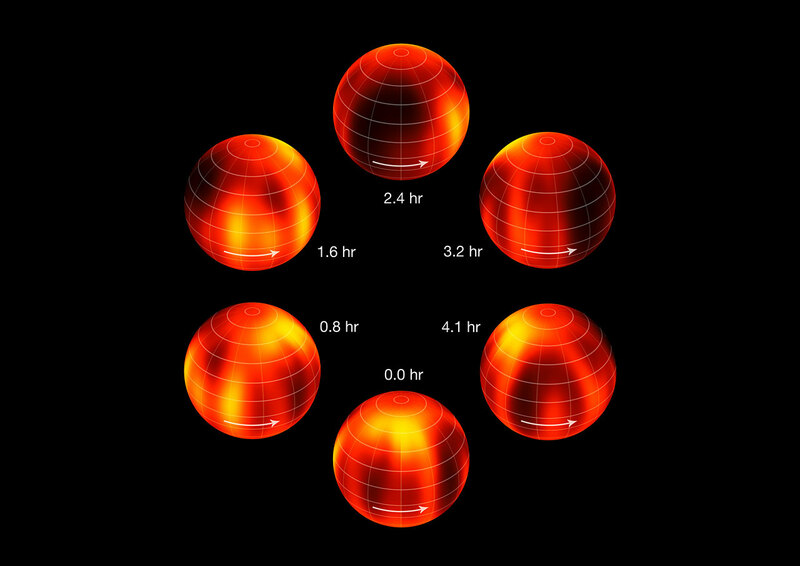 The discovery lends insight into weather on "hot Jupiters" – giant planets that orbit so close to their star that they are lost in its glare, making them difficult to observe. A brown dwarf is a failed star. Born with less than 8% of the Sun's mass, it never gets hot enough to sustain the same nuclear reactions that power main-sequence stars such as the Sun. Instead, a young brown dwarf glows red from the heat of its formation and also from short-lived nuclear reactions, then it cools and fades. Brown dwarfs are about as large as Jupiter but more massive and also much hotter, so they serve as surrogates for studying hot Jupiters. Moreover, like the Earth and Jupiter, many brown dwarfs have clouds. As a brown dwarf rotates, its clouds come into and out of view, which causes the light observable from it to vary. Brown dwarfs are much cooler than the Sun and therefore shine most profusely at infrared wavelengths. On 10 February 2013 Kevin Luhman of Pennsylvania State University was examining images from NASA's Wide-field Infrared Survey Explorer (WISE) spacecraft when he discovered the nearest brown dwarf to Earth. It is so close that only two star systems are nearer: the triple star Alpha Centauri, which is 4.4 light-years away; and Barnard's Star, which is 6.0 light-years distant. Luhman then found that our new neighbour – named "Luhman 16" – is actually a couple: two brown dwarfs orbiting each other. "Until now, all brown dwarfs were too far away and too faint," says Ian Crossfield of the Max Planck Institute for Astronomy in Heidelberg, who led the team that has taken images of clouds on one of these brown dwarfs. "We just couldn't study them in enough detail to resolve features on their surfaces." Because of its proximity, Luhman 16 boasts the brightest brown dwarfs that are known. They are about twice as far apart as Mars is from the Sun and orbit each other roughly every quarter century. Although similar in temperature – Luhman 16 A, the brighter one, is at 1500 K, whereas Luhman 16 B is at 1450 K – their atmospheres differ. Luhman 16 A's light does not fluctuate, suggesting a featureless atmosphere. So Crossfield and colleagues focused their attention on Luhman 16 B, whose light does vary. Because the brown dwarf is in the southern constellation Vela, the researchers observed its near-infrared spectrum with the Very Large Telescope in Chile. The astronomers used a technique called Doppler imaging, which exploits a star's spin to map the distribution of bright and dark areas. As a star turns, one edge moves towards us and light from this edge is blueshifted. Meanwhile, the opposite edge moves away and light from this part of the star is redshifted. If there is a dark cloud on the brown dwarf, it will block some of this light and an astronomer will see a dimming of blueshifted light when the cloud is at the edge moving towards us, and a dimming of redshifted light when the cloud is moving away from us. This effect is greatest at the star's equator and does not occur at the poles, so the technique can also provide information about the latitudes of the clouds. "For the first time we were able to see features geographically localized in two dimensions across the globe of the brown dwarf," Crossfield says. "We were able to see patchy features all across the surface, which are consistent with partial cloud cover." He says that bright areas probably indicate clear regions where we see deeper, into hotter layers of the atmosphere that radiate more energy; dark areas are clouds that block the radiation. These clouds have an exotic composition, however: they do not contain water. "They are made of silicate rocks and molten-iron droplets kept aloft by vigorous atmospheric motions," Crossfield says, because the brown dwarf is much hotter than the Earth. Luhman 16 B spins fast, once every 4 hours and 52 minutes – twice as quickly as Jupiter, the solar system's fastest spinning planet, which rotates every 9 hours and 55 minutes. Jupiter's spin creates bands in its atmosphere, but the current observations do not indicate whether Luhman 16 B exhibits the same phenomenon. The brown dwarf's namesake praises the new work. "It's a really neat result," says Luhman. "It's a nice illustration of the power of having an object that close to the Sun." He recalls how he detected the brown dwarf a year ago. "It was a startling discovery," he says. "It was surprising to find something that close to us that hadn't already been found." No one had unearthed such a nearby star for almost a century: astronomers spotted the faintest star in the Alpha Centauri system in 1915 and Barnard's Star in 1916. Crossfield and colleagues monitored Luhman 16 B for only one rotation period, but later this year they will watch it for a longer time, hoping to produce what Crossfield calls "the first weather movies of an object outside the solar system". The researchers report their work online today in Nature.